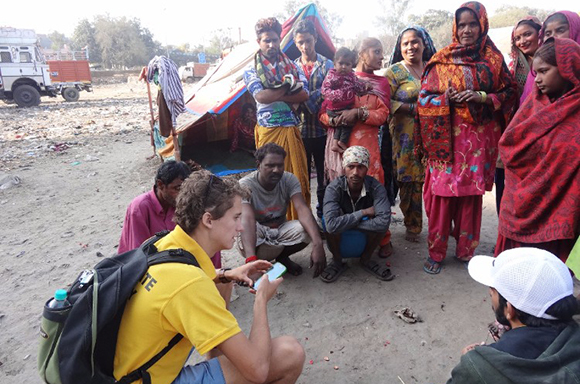 From humble beginnings failing to sell solar lights at a market stall, a group of Australian entrepreneurs has now brought light to 72,000 of India’s poorest people, writes Ellie Cooper in this week’s Spotlight on Social Enterprise. Pollinate Energy was founded by six young Australians in 2012, following a blackout in India that left more than 600 million people without power. 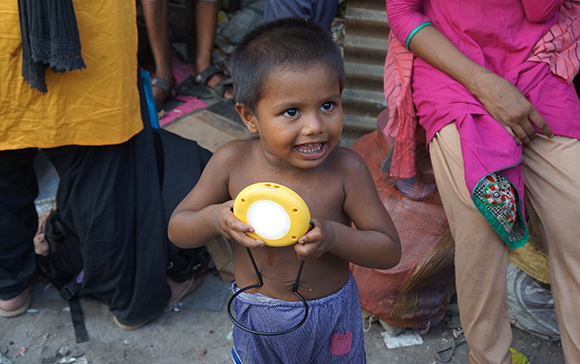 With backgrounds in sustainability, renewable energy technology and economics, they understood that they could use simple solar lights to address energy poverty. Globally, more than 1.3 billion people don’t have access to electricity, and over 300 million are in India alone. Despite economic development this represents 25 per cent of the country’s population. 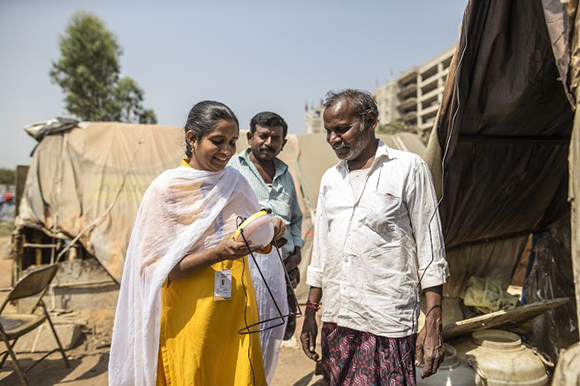 Pollinate Energy’s Australian national manager Manita Ray told Pro Bono Australia News about the impact of energy poverty on people living in India’s urban slums. “They live at the bottom of the pyramid, and they don’t have any access to electricity and very limited or no access to any sort of water or sanitation or basic infrastructure,” Ray said. “They earn around $1.50 a day and, because they’re living without access to electricity, they spend about $3 a week buying kerosene, which becomes their source of a very dim light. “But because they earn so little and they’re spending $3 a week on this kerosene, they basically have no way of breaking this poverty cycle that they’re in. Pollinate Energy’s founders created a solar light that, when paid off, would save the $3 a week otherwise spent on kerosene. However, they got off to a rocky start trying to reach people in need. “They sold none, no one actually came up to purchase it even though… it was a really good idea and it would actually solve the issues they were facing,” Ray said. 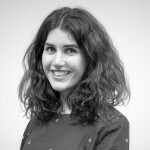 “And that’s when they realised that while the concept is successful and will be successful, the way they needed to do it would have to change, which is why they then decided that, ‘ok, we need [a] door-to-door approach’… and go to each family living in the slums and explain what the product is and the benefits and let them look at it and handle it. Ray said they created a “pollinator network” made up of local Indian men and women who are employed by the enterprise. “This is probably one of our core reasons why we’ve been successful,” she said. “They sort of run their own businesses, so we train them up to have their own business in a bag as such, and they speak the language, they understand the culture in the communities that we service, and they are out there every day selling these lights to the families living in the slums. The solar light is sold on a deferred payment plan to make it affordable. Customers pay for it over five weeks, and in around 10 to 12 weeks they break even on that payment. “It’s really the first step out of poverty for them. And as they save that money they can have access to other things that they need, for example if they need water filters they can now afford a water filter,” Ray said. She said the pollinators are vital to building a long-term relationship with customers. “We invest a lot in the local knowledge, and it’s not just a one-off transaction… they help explain what the product is, they help explain the payment structure,” she said. “They actually go back and get feedback as to how a product is working for them. It’s not just a simple, buy the light and that’s the end of it, we actually work with the pollinators to really understand who these families are and what their needs are. In under four years Pollinate Energy has installed nearly 16,000 sustainable systems, mostly solar lights but also other products. They’ve reached more than 72,000 people, serviced nearly 2,000 communities, and saved just over 86 million Indian rupees which would otherwise be spent on kerosene. On the environmental side they’ve helped avoid 1.64 million litres of kerosene and just under 4 million kilograms of carbon dioxide emissions. Ray said the impact on people in India was also twofold. “Obviously the people living in slums have the benefit, but one of our key beneficiaries are also our pollinators, so the people we employ to do the work,” she said. The social enterprise in India is wholly owned by Pollinate Energy, which is a charity run in Australia to financially support operations. “At the moment we do all the revenue raising to sustain the growth and operations in India,” Ray said. “We’re in four cities in India at the moment, Bangalore, Hyderabad, Kolkata and Lucknow. So each of those cities make an earning from selling the lights and other sustainable products. Obviously there’s a margin on them so we get profit from those sales. “We do a fellowship program which provides a bit of income for us, where we send international fellows overseas and they are critical to our work because they actually form our workforce on the ground and help us solve problems, they also have a fundraising target which covers their costs when they’re there, and part of that goes towards running the city that they’re in. She said the social enterprise is on the road to achieving financial sustainability. “We expect that by the time we get to city 10, the income generated from those sales from those products will mean… we can sustain our operations in India, but also sustain the growth,” she said. Ray said working in both countries presents different challenges. “Working in India is a challenge in itself, understanding the regulations and the timing involved in setting up each new city is always a challenge, but obviously we love our work there and that’s why we’re there. So we embrace it and we plan for it,” she said. “Our pollinators are one of our biggest assets and why our business is so successful, but it’s also difficult to attract and retain really good ones, just like in any workforce. So that’s always a challenge. She said an often-asked question is whether Pollinate Energy will expand to other countries experiencing high levels of energy poverty. But, for the time being, their efforts will stay focused on India. “India’s very, very large and the slum population is increasing every year, and that’s because people are coming from rural India, they come from rural India to come to urban India to work, that’s the only place they can find work. The construction industry in India is growing rapidly,” she said. “So the population that we need to serve is actually quite large, and it’s growing. We want to achieve our vision to get to 2020 and reach the 20 cities. “We have had conversations with people in other countries, but it’s not in our short term to go international as such. “We want to do what we do best and service the people who we know best as well.